This was one messy little day in politics. I was on a train up to Wisconsin, where I'm going to be giving a presentation tomorrow, and during that time not only had John McCain "suspended" his campaign -- but SurveyUSA had actually put out polling on it! 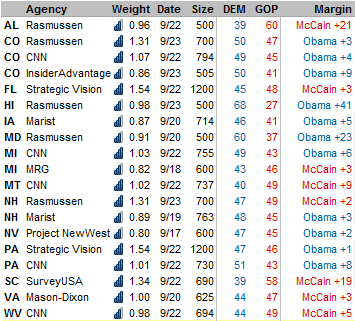 How can Barack Obama be 8 points ahead in Pennsylvania according to CNN, but 1 point ahead according to Strategic Vision? Because Strategic Vision's polls have had a 2-3 point Republican lean so far this cycle, and CNN's have had a 1-2 point Democratic lean. If you are able to account for that -- and we do -- the two polls are within one's anothers margin of error. The only thing we can say for certain is that things are going well for Obama in Colorado, where all polls have him ticking upward fairly sharply, and all have him polling ahead of his national numbers. But this is a day where it's probably best to take a mulligan and wait a day or so for things to settle down.